Angel Broking App is one of most powerful designed App in the broking industry. It has all the features which any type of investor requires while trading on the go. 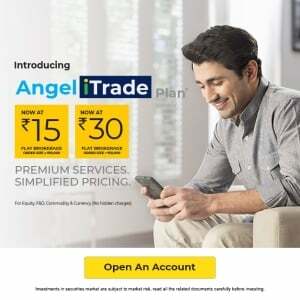 Lets have a detailed analysis of Angel broking mobile app. 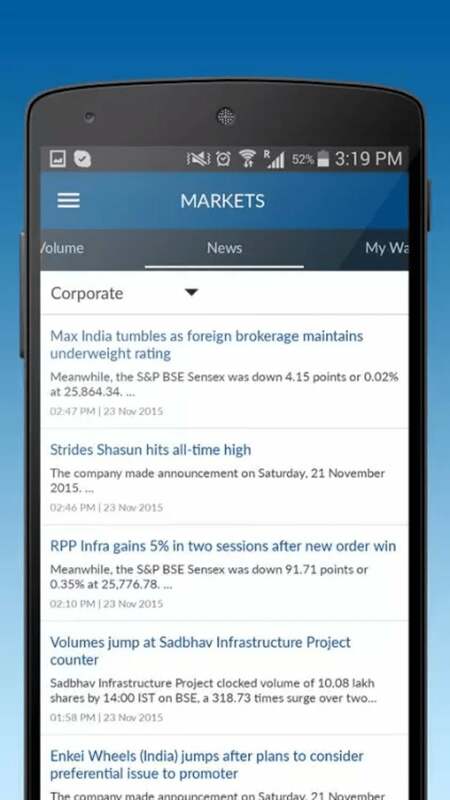 Angel Broking App, encompasses entire stock market in your mobile. 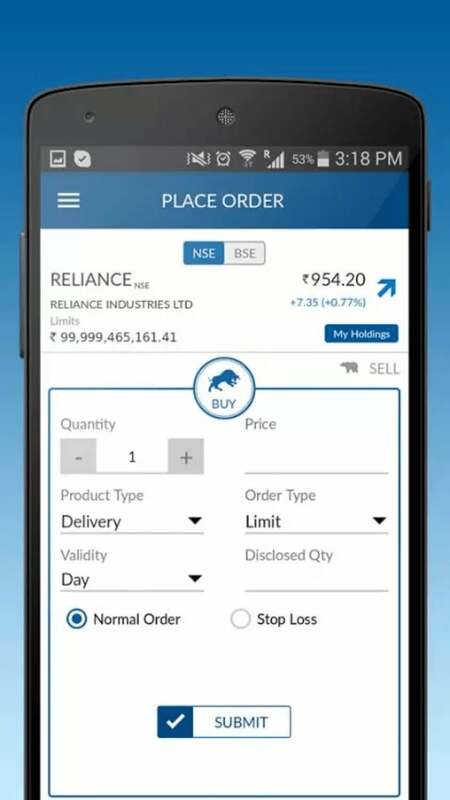 The app provides access to global indices, stock recommendations, portfolio health check, mutual funds, live market, customized advisory. The app also facilitates ARQ, the advisory feature of Angel Broking. On launching the app, the first screen that appears is the login screen. Herein, one needs to provide trading account’s login credentials. This ensures basic security to the user. Also, this login screen would appear whenever the user closes the app or even switches between the apps or goes to home screen without logging off, thus ensuring another level of security. Post logging in for the first time, the user would have to fill in the basic profile related details under “My Profile” tab. Apart from personal details, it would ask for details like DP, Bank details and trading account details. Angel Broking ensures that these are secured and confidential and not share with any third party vendors. 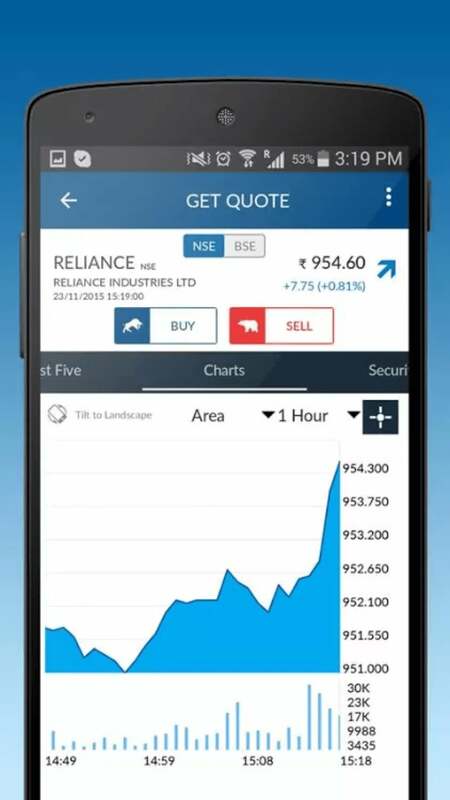 The app allows one to check his/her portfolio across all segments in just one click. On tapping on the portfolio option, separate tabs come up horizontally, each tab containing the details of each kind of investment i.e. equity, mutual funds, currency, F&O or commodity. On tapping the tab, the first few lines would summaries the total portfolio value and give details of unrealized gain/loss and the day gain/loss. Thereafter, a list of assets held i.e. list of scrip held would be appearing. To undertake a buy/sell trade, one simply needs to tap on that security. This would open a screen giving detailed overview of the scrip help. This screen would also have “Buy”, “Sell” and “More” options. The buy and sell options can be used to place the order. The “More” option would take the investor to a detailed analysis of that scrip i.e. the performance of that scrip. Herein the user would also have options to view the performance in charts and historic charts as well. One can also access the latest news on that scrip, the ratios for analyzing and also recommendations/suggestions. 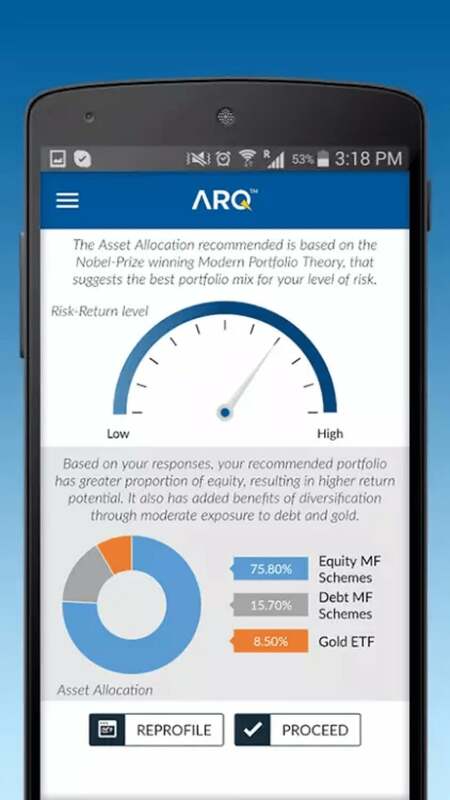 At the end of the scrip list under portfolio screen, would be an option to check ARQ score – “EQ Portfolio Score”. It also gives an option to improve the score. However, on opting for this, the ARQ technology would place certain trade orders thereby improving the portfolio position. Another option for evaluating the performance of the scrip is “Get Quote”. This option gives a detailed chart analysis for the investor to understand the performance of that scrip. The chart can be customised to show the live feed or the historic feed or intraday data. This also gives an option to customize the overplay and indicators for users to evaluate the data as per their preferences. The App also provides access to variety of report – Funds summary, security holding report, Transactional report and Research reports. The fund summary report gives a detail of the ledger amount held, the margin money available and the shortfall in margin money. This also gives the total collateral taken, if any. Then comes the security holdings which gives a detailed view of the security held by the investor. 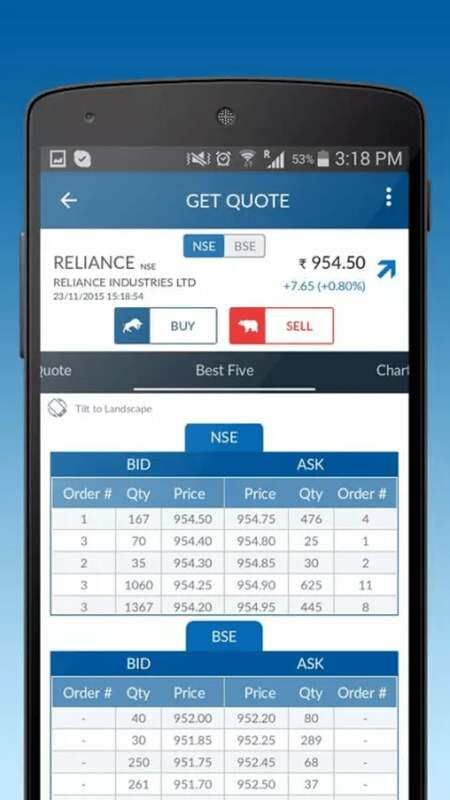 One can also view and get the reports related to funds transaction, DP transactions, auction details, trade history, P&L summary, contract notes etc. by tapping on Transactional Reports. The other feature of this app is the stock ideas that it gives. It publishes the hot pick scrip which are divided under three parts – Fundamental, technical and derivatives. For a derivative trader, the app allows its users to add scrip and securities to the watchlist so as to keep a track of their performance and decide on whether the scrip is worth taking a shot or not. One can select among the market i.e. whether cash or F&O. The scrip can be selected with different expiry dates. While discussing the app of Angel Broking, it would be pertinent to discuss ARQ – the technology which Angel Broking claims to be the cutting edge and its USP vis-à-vis other competing houses. The ARQ basically is an engineered investment agent. To use this ARQ, one can tap on the “Experience ARQ” in the main option list. On selecting this, the system would ask for certain details to judge the user’s risk appetite. Based on the inputs of the users, it would throw up certain ideal portfolio consisting of equity, debt, mutual funds and Gold ETFs. Then the ARQ calls for a lumpsum amount that one tends to invest in. Thereafter, ARQ throws up the suggested scrips and funds for users evaluation. The user can evaluate these and then place an order in that screen itself. A very unique feature of this app is that it allows creation of family level portfolio i.e. a user can add a non-angel user’s account as well to view the performance of their scrip. 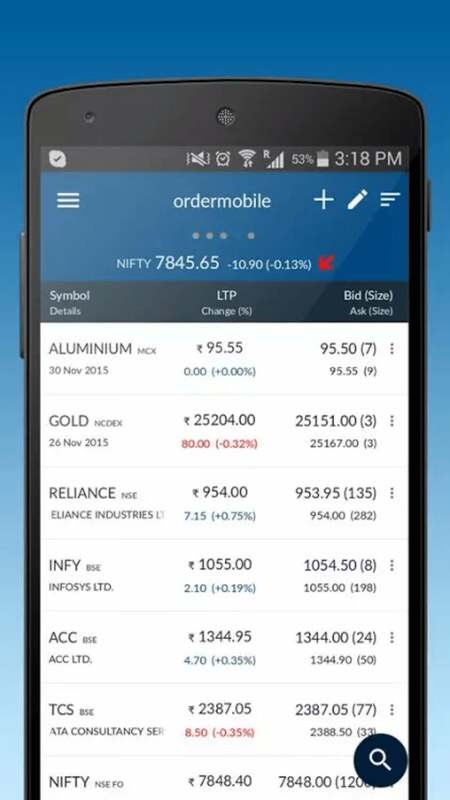 Their app has been awarded as Top Trading App for the year 2016. Angel Broking App is one of the highest rated Trading App in the Country. This app is being used by thousands of users daily for all types of Investment purposes. It allows to invest in Stock Market aswell as Mutual Fund.